Former Aberdeen City Council leader accuses Labour of ‘bullying tactics’. Two senior councillors have clashed over Aberdeen’s controversial City Garden Project. SNP leader Callum McCaig has called for an emergency meeting to discuss the business case for a £92m Tax Incremental Financing loan from the Scottish Government to fund five city centre regeneration projects, including the transformation of Union Terrace Gardens. Councillor McCaig wants the document to go before a special meeting of the audit and risk committee, which the SNP leader chairs, next week. However Labour group secretary Willie Young has said Mr McCaig will be removed from the post if he does not withdraw his request, leading the SNP representative to accuse Labour of “bullying tactics”. Councillor McCaig told STV: “I think it is an attempt to bully. If you have a situation where you have been issued an ultimatum where you’re told to do as we say or you don’t get to scrutinise us at all then it’s the kind of thing you expect to find in the playground rather than from the leadership of the city council’s administration. Mr Young has said that Councillor McCaig “has to remember that he is no longer the leader of Aberdeen City Council”. He said: “Councillor McCaig has to accept that there is a new political administration at Aberdeen City Council which is Labour-led with support from the Conservatives and independents. The TIF case is going to full council on August 22 as agreed between SNP and Labour. 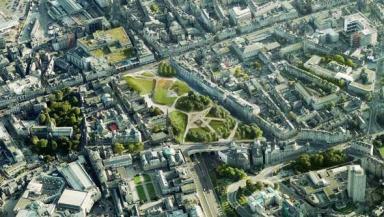 A public referendum has already been held on the £140m plans to redevelop Union Terrace Gardens in the centre of Aberdeen. More than 85,000 people voted in a public referendum on the contentious project with 52% voting in favour of the project. Local businessman Sir Ian Wood has pledged £50m towards the project and a further £20m is expected to be generated from the private sector.Aberdeen City Council is proposing to borrow a £92m TIF loan to cover the remaining cost of the project along with four other regeneration schemes.